NOTE: I do not do pan size conversions or measurement conversions. Please check on Google for all conversions. Since many readers have asked about the types/brands of products I use for cooking and/or baking. I have compiled a list of the items most commonly inquired about. Baking pan size substitution: You can find a guide on baking pan size conversions here. I do not do pan size conversions, and you will need to google for change in temperature, or baking time, or both. Butter – Unless stated otherwise, I only use unsalted butter for cooking and baking. 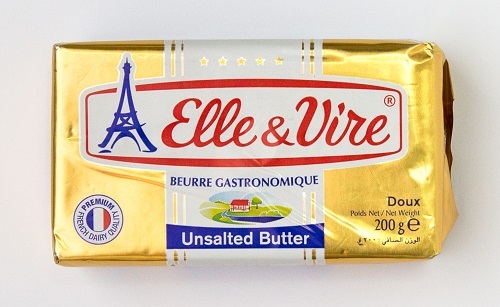 I normally use President butter and Elle Vire (available at all supermarkets) for baking and Petit Normand butter or Goldtree Butter (from Phoon Huat) for experiments. I use salted butter for butter cake recipes. 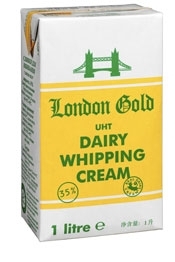 Cream/ Heavy Cream – I use London Gold Dairy Whipping Cream (from Phoon Huat) for cooking and baking. I also use President Whipping Cream (from all supermarkets). If a recipe calls for double or heavy cream, I usually substitute it with one of these whipping creams. Oil – Unless otherwise stated, I use canola oil for cooking and baking. 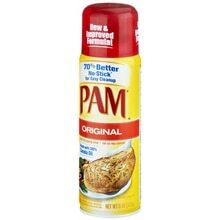 Oil spray – I use PAM oil spray to grease baking trays as well as for a light coating for cooking. I also use Gold Canola cooking oil spray from Phoon Huat. Eggs – Unless otherwise stated, I use 65g eggs (with shells) at room temperature for all my recipes. Chicken/Beef Stock – Whenever possible, I make my own chicken stock. But at times when I run out, I mix store-bought stock (salted) and water in the ratio 1:1. Buttermilk – I usually use store-bought buttermilk. But when I run out, I use this recipe to make buttermilk – Combine 1 scant cup milk (whole, low-fat or heavy cream) with 1 teaspoon lemon juice or white vinegar. Let stand 5-10 minutes. Let the mixture stand at room temperature for 5-10 minutes. When it is ready, the milk will be slightly thickened and you will see small curdled bits. (This substitute will not become as thick as regular buttermilk.) Use this substitute (including curdled bits) as you would buttermilk in your recipe. Milk – Unless otherwise stated, I use whole (full-cream) milk for cooking and baking. I prefer Meiji Full-Cream Milk. Plain flour – I used Prima Top flour as a substitute for Plain flour. Self-raising flour – Self-rising flour is flour that has a leavening agent – baking powder – and salt added to it during packaging. Since the ingredients are evenly distributed throughout the flour, you will get the same nice lift to your baked goods every time you use it. If you don’t have self-rising flour and you have a recipe that calls for it, you can make your own by combining 1 cup plain flour or top flour with 1 teaspoon baking powder and 1/4 teaspoon salt. Similarly, if you only have self-rising flour, you can reduce the baking powder and salt called for in a recipe that uses standard all purpose flour. It is not advisable to use self-raising flour in place of normal flour because the ratio of flour:leavening agents will be changed. Cake flour – Cake flour is a low protein flour that is made from soft winter wheat. It has a protein content of about 8% and is usually bleached, which gives it a very fine texture and a very light color. Because it has such a fine texture, cake flour should be sifted before incorporating it into a recipe to prevent clumping. Cake flour is great for making cakes and other baked goods because it gives you a very tender result. This is because it has such a low protein content compared to other flours and less gluten forms when you mix it into a batter, producing a cake with a fine, soft, even crumb. To make cake flour, take one level cup of all-purpose flour, remove two tablespoons, and then add two tablespoons of corn starch back in. I use Prima Cake flour. Sugar – Unless otherwise stated, I use caster sugar for baking. Caster Sugar – This is superfine granulated white sugar. Since the sugar crystals are very fine, they will dissolve more quickly into batters. You can use Fine Sugar for baking but you will need to beat a lot longer. Light Brown Sugar – This type of sugar has some molasses added in. It has a somewhat wet and sandy texture but it is not as sticky as muscovado sugar. I normally use this sugar when the recipe calls for “brown sugar”. This can be substituted with Dark Brown Sugar. Dark Brown Sugar – This is similar to Light Brown Sugar and can be used as a substitute for Light Brown Sugar. It simply contains more molasses than Light Brown Sugar. Muscovado Sugar – This sugar contains quite a bit of molasses. It comes in two forms – Light Muscovado Sugar and Dark Muscovado Sugar. The dark version contains more molasses than the light version. This sugar is wet, sticky and sandy and has a stronger flavor that Light Brown Sugar. Demerara Sugar – This sugar will hold its form when baked (ie, it will not melt). It is usually used as a topping for muffins or other bakes where texture is required. Icing Sugar – Also called “Confectioner’s Sugar“, this is sugar that has been ground into powder. This sugar melts easily and usually needs to be sifted before use. Salt – Unless otherwise stated, I use Kosher salt for cooking and baking. Sea Salt – Sea salt is obtained by evaporating seawater. This salt is usually not (or very minimally) processed so it contains trace levels of minerals like potassium, calcium and other minerals. I use Maldon sea salt flakes, usually available at Cold Storage and Jason’s Supermarkets. 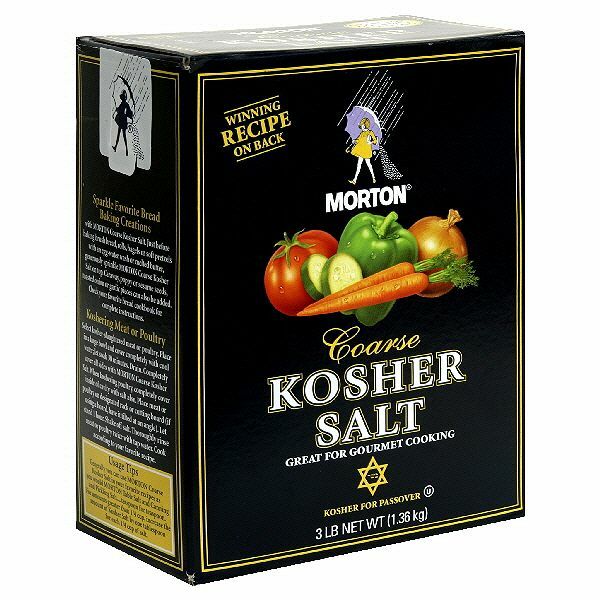 Kosher Salt – This is the salt that I use the most often. Kosher salt is a coarse-grained salt made from salt crystals and is usually not iodized. Because it is coarse, it is easily picked up by pinching with one’s fingers and easier to gauge. I use Morton Salt, usually available at Cold Storage and Jason’s Supermarkets. Fleur de Sel – Literally translated as “flower of salt” in French, fleur de sel is a hand-harvested sea salt collected by scraping the top layer of salt before it sinks to the bottom of large salt pans. Because of its relative scarcity and intensive production, fleur de sel is one of the most expensive salts in the markets. This is a moist salt and is sprinkled on cooked food or bakes. I buy fleur de sel from Amazon. Table Salt – Mined from salt deposits, table salt is processed to purify and get rid of all other minerals and contaminants before anti-caking substances are adding to prevent the salt from sticking together. Table salt may be iodized. I do not use table salt. Bicarbonate of soda/ Baking soda (and Baking powder) – Baking soda is pure sodium bicarbonate. When baking soda is combined with moisture and an acidic ingredient (e.g., yogurt, chocolate, buttermilk, honey), the resulting chemical reaction produces bubbles of carbon dioxide that expand under oven temperatures, causing baked goods to rise. The reaction begins immediately upon mixing the ingredients, so you need to bake recipes which call for baking soda immediately, or else they will fall flat. On the other hand, baking powder contains sodium bicarbonate, but it includes the acidifying agent already (cream of tartar), and also a drying agent (usually starch). Baking powder is available as single-acting baking powder and as double-acting baking powder. Single-acting powders are activated by moisture, so you must bake recipes which include this product immediately after mixing. Double-acting powders react in two phases and can stand for a while before baking. With double-acting powder, some gas is released at room temperature when the powder is added to dough, but the majority of the gas is released after the temperature of the dough increases in the oven. Cream of Tartar: The most common use for cream of tartar is to stabilize egg whites when making meringues or meringue toppings. The cream of tartar not only stabilizes the egg whites and allows them to maintain their texture when whipped into stiff peaks. Cocoa Powder (Dutch Processed) – Dutch-process cocoa powder is made from cocoa (cacao) beans that have been washed with a potassium solution, to neutralize their acidity. Dutching cocoa powder makes it darker and can help mellow the flavor of the beans (David Lebovitz). Unless otherwise stated, I use Belcolade or Valrhona Cocoa Powder in all my recipes. Cocoa Powder (Natural) – Natural cocoa powder is made from cocoa beans that are simply roasted, then pulverized into a fine powder. Because natural cocoa powder hasn’t had its acidity tempered, it’s generally paired with baking soda (which is alkali) in recipes (David Lebovitz). This causes a reaction with the baking soda. Unless otherwise stated, I use Hershey’s Natural Unsweetened Cocoa Powder for recipes that require natural cocoa powder. Baking Chocolate – Baking chocolate, also referred to as bitter chocolate, cooking chocolate and unsweetened chocolate, is a type of chocolate that is prepared or manufactured for baking. Semi-sweet chocolate is less bitter so they are used in cookies. Puff Pastry: I use ready-rolled puff pastry for all my dishes and bakes. They are available at the bigger supermarkets and Phoon Huat. When using puff pastry, remove one sheet at a time and keep the remaining pastry sheets in the fridge until needed. Vanilla Extract: I only use Vanilla extracts in my bakes. Vanilla extract is usually a natural product made by soaking vanilla pods in a mixture of ethyl alcohol and water. The flavour of the vanilla is taken up by the liquid ingredients and makes the vanilla extract that we use in cooking. On the other hand, Vanilla essence is usually a synthetic (ie chemically produced) vanilla flavouring and is cheaper than the natural extract but I don’t believe in putting more strange chemicals in my body than is necessary. You can also substitute 1 teaspoon vanilla bean paste for 1 teaspoon vanilla extract if you wish to get flecks of vanilla bean in your bakes. Vanilla Beans: I use Madagascar vanilla bean pods. If unavailable, I substitute 1 tablespoon vanilla bean paste for 1 vanilla pod. Pandan Extract : I use Koepoe Koepoe pandan extract. Chilling cookie dough for a minimum of 2 hours: Chilling permits the gluten strands in the flour to relax, avoiding a “rubbery” consistency in the final product. The elapsed time may also permit the flour to absorb more of the moisture in the dough, so the cookies do not spread out so much when baking. Ban-marie: A bain-marie is a water bath or double boiler. It is a French term for a piece of equipment used in science, industry, and cooking to heat materials gently and gradually to fixed temperatures, or to keep materials warm over a period of time. Dutch oven: A Dutch oven is a thick-walled (usually cast iron) cooking pot with a tight-fitting lid. Dutch ovens have been used as cooking vessels for hundreds of years. They are called casserole dishes in English speaking countries other than the USA. A heavy dutch oven is really a nice thing to have. Aside from the fact that a heavy cast iron or iron/enamel dutch oven is good for browning and braising, the heavy cover really seals well and can cook things faster on the stovetop. NOTE: If you do not have a Dutch oven, you can use a baking tray, and cover it with aluminium foil. Vanilla Essence Vs Vanilla Extract: I get asked if vanilla essesnce can be used in place of vanilla extract a lot. Uh, NO, NO and NO. Pure vanilla extract is made by macerating and percolating vanilla beans in a solution of ethyl alcohol and water. Imitation vanilla extract contains vanillin, made either from guaiacol or from lignin, a byproduct of the wood pulp industry. Do you even know what that means? Then why eat it? 1. Go through the strawberries. Discard the ones that are damaged or unripe. 2. Rinse the strawberries in cool water and pat them dry (thoroughly) with kitchen towels. Hull the strawberries (ie, remove the green stem). 3. Place the berries in a single layer on a sheet of baking paper. Put the tray in the freezer until the berries are frozen solid. If unsure, freeze overnight. 4. Place the berries in ziplock bags – get as much air out of the bag as possible before you seal the bag. 5. The frozen berries can be store up to 6 months in the freezer. These oats are made by steaming the oat groats so as to soften them, before they are rolled into flakes. The steaming process partially cooks the oats so the cooking time is reduced. Since they are flattened when rolled, they also have a greater surface area, thus they cook faster. These oats are great for using in baked goods like cookies and muffins. These are like regular rolled oats but they are steamed and rolled more so they are partially cooked even more. They are also rolled thinner than old fashioned oats. As a result they are creamier and less chewy. Quick Rolled Oats are digested more quickly so you don’t feel as full for as long. These can also be used in baked goods like cookies and muffins. These oats are steamed for an even longer time so they are pre-cooked. They are rolled even thinner and are dehydrated. Because the oats are pre-cooked, you need to only add boiling water to re-hydrate them before eating. These oats are usually not used in baking. White miso is made from soybeans that have been fermented with a large percentage of rice. The actual color of this miso ranges from light beige to white. This miso has a sweet taste so it is recommended for use in condiments like salad dressings or in light sauces. Yellow miso is made by fermenting soybeans with barley and sometimes a small percentage of rice. It ranges from yellow to light brown. Yellow miso has a mild, earthy flavor and is better for general use in not only condiments, but also marinades, soup, as well as glazes. Red miso is also usually made by fermenting soybeans with barley or other grains, but with a higher percentage of soybeans and using a longer period of fermentation. This can range from red to dark brown. The deep umami flavor of red miso can be overwhelming if used in mild dishes, but is great for hearty soups, braises, and glazes. Please convert the ingredients in your recipe using the number of eggs required as a guide. Chiffon Woes – I can’t remember where I took this from; if anyone knows please inform me so I can credit the source. 1. If the cake falls out of the pan when you overturn it, the sides and the bottom are probably not browned. This means the cake is under-baked. Check the temperature of the oven or bake the cake for a further 10 minutes. If the top is already sufficiently browned, tent the cake with aluminium foil. 2. If the cake slips out of the pan but the sides are browned, check the recipe’s hydration ratio. If there is too much liquid in the cake, the cake will be too heavy. When you overturn it, it will be pulled down by its own weight. After slipping out of the pan, the cake will start collapsing and becomes flattened. 3. If the cake has caved in on the sides, the egg whites could have been over-beaten. 4. If the top of the cake (what was previously the bottom) is sunken in, the oven temperature is too high. If the oven temperature is too high, it will cause the cake to over-expand. So when the cake relaxes after cooling, it will sink. 5. If the top of the cake splits, there is no need to panic since it will become the bottom. 6. If the oven temperature is too low, the cake will have problems rising and will not be able to reach its optimum peak. The cake will be heavy, short and dense. 7. If the oven temperature is unstable, the cake will not rise properly and may collapse. If you are unsure of the temperature of your oven (especially if the oven is old), buy an oven thermometer to check. Or get a new oven! 9. Most recipes will instruct you to turn the cake upside down immediately after you take it out of the oven. If you do not do so, the cake will collapse on its own weight since the cake structure is still unstable when it is hot. However, if the temperature outside the oven is very low (cold draft), the cake will shrink very quickly. If there is a vast difference in temperatures, open the oven door slightly to circulate the air a little to even out the temperatures before taking the cake out. 10. If there are many big holes in the cake, air may have been trapped when you poured in the batter. Lift the tube pan about 10cm off the work top and drop it a few times before baking to rectify this. If you did not fold the egg white properly, you will get uneven holes as well or you can see speckles of whites in the cake. 11. It is normal for chiffon cake to lose some of its height after cooling. However, if it loses at least half of its original height, check if the egg whites were beaten to stiff peaks or if you had deflated the egg whites during folding. Agar-agar: Agar is a gelatinous substance that is originally made from seaweed. It comes in 2 forms – strip agar and agar powder. Gelatin – Gelatin is a colorless and odorless substance that is made from the collagen found inside animal bones and skin. Gelatin comes in the form of powder, granules or sheets. It is not advisable to substitute gelatin for instant jelly powder because instant jelly creates bouncy texture while gelatin only helps to set whatever liquid that you use. It will not yield the same texture as instant jelly will. I really love your recipes. So far have tried the cabbage rice dish, yam rice, sio bak and puff pepperoni pizza. My family loves them too. Thank you so much. I wonder why you have not posted any lamb dish in your blog. Would love to try out some lamb dish from your recipes. Hi Nana, thank you so much! It is funny you mentioned that because this is the year I am going to learn how to cook lamb! LOL – the reason why I have not done any lamb dish is mostly because I have yet to find a good supplier of lamb here. In Australia we get such good quality lamb I will only cook lamb if it is good lamb. Keep reading and I promise I will share some lamb dishes soon! hi Diana, thank you for all these valuable information and wonderful recipes. May I ask which brand of vanilla extract do u get? I have tried a couple of brands but always find them not smelling good enough after the bake.. Understand there are different types of measuring cups. May I know the measuring cup that you are using hold how many ml of water per cup ? Hi CK I am glad this is helpful! Would like to try your receipes .. Looks so delicious .. I determined to try out your yuzu chiffon cake, looks delicious! just 1 question, do i need to grease the chiffon pan? never bake a chiffon cake before.. I HAVE BEEN FOLLOWING YOU SINCE I STARTED TO SEARCH FOR RECIPES.THANK YOU SO MUCH FOR YOUR VERY DETAIL ILLUSTATIONS AND REALLY SHARE OUT RECIPES.THERE REALLY MADE MY DAYS .I WILL FOLLOW…………..
What kind of mixer do you use? Does it have to be a kitchen aide? Hi Angie I use a Kenwood and a Bosch. Hi, may I know what model are you using? which is better? May i know the measurement you used? I dont know how to measure by cups..
How can we make our own vanilla extract? Also, where in Singapore can we find vanilla pods? Thank u! Hi! Is wholewheat flour and plain wheat flour the same? Can you share where you get the buttermilk? Thanks! Hi Diana, do you have muffin recipe? Hi Karen I have many! Just got to the search function on the right column of the blog and key in “Muffin”. Hi! If we would like to make more cookies / muffins, is it ok to double or triple all the ingredients? Thanks! The recipes sound great but I don’t understand your grams and C temperatures. It must be European.. Any conversions to the American measurements? Just wanted to thank you for restoring my faith in my baking skills – I have been trying out your various muffin recipes (think I have done about 5 now!) to a certain amount of success (my own LAM is very grateful to you too!) – I was pretty awful at baking before this. I have a potentially silly question (did try Googling it, but no luck): Is a cup in cooking twice that in baking – I noticed that you write it as 125g for baking recipes and 250g for cooking recipes? I am so so glad to read your message – I love it that you’ve had success with the muffins! Maybe after this you will start baking cakes! 🙂 With regards to your question about Cup vs Grams, because this is a volumetric weight, there will be a difference. One cup of water will weight more than a cup of flour. To be safe, google for conversions before you try any recipes that don’t already have the conversions done for you. Hope this helps, and hope you will achieve even more success with your bakes!! Thank you for sharing the compilation of the Frequently Asked Questions. They really cleared my doubts. You are truly a Domestic Goddess! God Bless You. Enjoy reading your blog! Can I know where do you get the grater? Thank you! Hi Audrey thank you! Are you referring to the microplane grater? If so you can find it in any good departmental stores, or online at Amazon. May I ask you a question on deep-frying. I saw from your pictures that you usually do deep-frying in a saucepan, or something that looks like it? How much oil do you use (like fill to the top? ), what brand of oil and how long to heat the oil before it’s ready to deep fry food? Hi Karen sorry for the delayed reply – I just saw your comment. I deep-fry using my portable induction cooker and the bowl (usually used for steamboat) that comes with it. I usually fill the bowl about 2/3 full and since I have a few bowls I filter the oil into another bowl and re-use it a couple more times, depending on what I had cooked. Since induction cookers heat up the oil pretty fast, I don’t have to wait very long. To test if the oil is ready, drop a few bits of flour into the oil. If they sizzle, the oil is hot enough! What is your preferred brand of butter you use for muffins and cakes? Hi Selene it is the babas curry powder for meat. I am new to baking. Noticed that you used different utensils when preparing the chiffon cakes eg. beat the yolks and whisk the eggs. Do you have a FAQ on the different types of whisks that we should use? Would we be able to achieve the same result with only a simple whisk? Thanks. Hi June a simple whisk will work but you have to make sure your meringue has reached stiff peaks – a lot of whisking! I am quite a newbie in baking and i am quite confused with heavy cream or double cream as i always cant find it from the store. Can i know is thickened cream same as heavy cream ? Because some of the ice cream recipes are require to use heavy cream, same as doing the tiramisu. Hi yes they are the same. only fat content may be different. May i ask where do you usually get your breadcrumbs? I have been going around to bakeries and can hardly find them selling it nowadays. May I check whether you have recipe for sourdough bread? Hi. 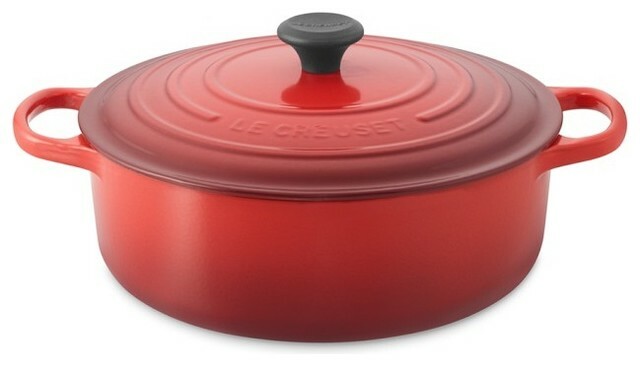 I am interested to purchase a Le Creuset as I have heard so many good reviews but hesitate due to the price.As the best time to buy will be during their annual sales which is super crowded as all are aiming for the sales. I would like to know if it’s really that good? cant we achieve same result with pressure cooker or those stainless steel pots? Thanks for the recipe…it taste really good and am gona make some for my HK friend to try..and convince them that its just as good as pandan flavour. Before I was introduced to your Domesticgoddesswannabe, I was always making cakes beating the egg yolk & white together. I tried your butter cake beating the eggs separately and the cake turned out pretty good. I just bought a KitchenAid, I love the way my butter/sugar beat in this new appliance. Here is my silly question, how do you manage to beat butter, sugar, egg yolk, flour and finally the egg white together in the mixing bowl. Do you use the same bowl for beating the egg white? I tried using a different bowl and it nearly flew off the KitchenAid. Hi Diana, thanks for the list of FAQ, this is very informative! Where could I find info on differentiating between soft peak with stiff peak? Thank you for your effort in putting together the about Frequently Adked Questions to help us. I am new in baking and recently, I noticed that my chiffon cakes have a layer of “Kueh” texture at the bottom (top before inverting). It is abt 1/5 of my cake’s height. Would you be able to advise what could have gone wrong. Hi it could have been underbaking. Try baking for a longer time. When a recipe ask us to pre-heat the oven, it usually never states how long to pre-heat and at what temperature. What is your advice on this? If you are using a bosch oven, it indicates when the desired temperature is reached. Otherwise you can buy an oven thermometer and stick it in the oven to see if the desired temperature has been reached! After banking, the cupcakes turned out well but i realised that the bottom of the cupcake liners is always greasy and oily. What is the reason behind it? Plus, does the quality of butter affect the baking results of cupcakes? May I know where u buy ur jap cooking sake? Just read through your “trouble shooting” of Chiffon cakes, the side carved in due to over beating of egg white. Maybe that’s what happened to my Pandan Chiffon this morning. I will try again tomorrow. I must perfect it before I call it quits. The very first time that I made the Pandan Chiffon which turned out the most successful, I followed your instructions. I recollect you mentioned that you lowered the temp to a certain degree the last 20 mins & again further lowering of the temp last 5 mins. I can’t seem to find that message anymore. Would that help to make a perfect Pandan Chiffon? I have quite a few packs of self raising flour. Just wonder if I can replace cake flour in Chiiffon cake with self raising flour? Thanks! I am trying to register for the Chiffon Cake class and I am having problem to charging my credit card because I am from Germany but currently I am in Singapore visiting. Is there a telephone number that I can call. Hi! I am about to buy a bread machine and I hesitate between Panasonic SD-P104 Bread Maker and the Zojirushi HOME BAKERY BREAD MAKER BB-HAQ10. Do you have any recommendation? Is it really important to have a separate yeast dispenser? no it is an added feature. I recently chance upon your site and is such a gem! Thank you for sharing all the wonderful recipes and the detailed instructions especially also how you would provide all measurements in weight as I don’t seem to get the cups measurements right. In fact, I just attempted a ‘simple’ Banana muffin with sliced almonds recipe of yours but It I didn’t turn out well for mine. Somehow when I peel of the cup liners, I don’t get a pretty whole muffin but kind of almost having the bottom ‘gone’ (not sure you know what I mean here). Wondered if you could help me understand what I might have done wrong? Also, Seperately, may I know what brand of instant coffee do you use in your recipes and how much more to add if I want a stronger coffee flavour as I do not have coffee extract. Thanks much! I am not sure what you mean Jane. Bottom is gone? I use nascafe coffee. Just made a Pandan Chiffon cake, haven’t done one for a few months. I am rather disappointed with the result. Texture fine, cake cooked, taste good but cake appeared shrunk not collapsed. When I took cake out of the oven, I immediately turned it upside down to cool completely. The cake seems to be breaking apart!! What about the instant yeast you use in the bread? Any particular brand? As i’ve only managed to find a 8″(20cm) chiffon pan, may i know which recipe should i use? 18cm or 21cm. probably the 21cm recipe. your cake will be taller. Would i need to adjust the baking time or temperature? Hi Domestic Goddess, I have tried your butter cake recipe and its simply superb. I intend to get a table top oven for my cake projects. Can you recommend me a good oven ? Hi I use Bosch ovens but it is a built-in oven. I have little knowledge of table top ovens. Hi, which coconut oil do you use for Pandan Chiffon? i tried making it with coconut oil, however the solid texture of the oil doesn’t seem to incorporate into the egg yolk mixture and when the cake is baked, it is not sponge texture.i’m not sure if it’s because the oil is solid. Do you reckon i need to double boil the coconut oil first to melt it? Thanks in advance for your advise. melt the oil before using so it is liquid and not solid. Hi Diane, for the pandan paste chiffon cake recipe, do you use the fan-forced option on your oven at 170C or is it just on the normal oven setting? Thank you for all the details and FAQs posted. Really, it’s a delight to be on this blog. Can the fee for attending your baking workshop be claimed from MySkillsFuture Credit? Hi Stephan currently no, unfortunately. I would like to refer to your Korean chicken ginseng recipe, do you mean we place marinated glutinuous rice or cooked ones into the chicken? I used marinated RAW glutinous rice, but you can just use RAW unmarinated glutinous rice if you like. As I’m living in overseas I do not see top flour is the supermarket normally what I have seen is self rising and wheat flour. What can I replace with top flour? Can cake flour and self rising flour mix together to become top flour? I think you are better off using plain flour if you do not have top flour. I am interested in at least 4 of your upcoming workshops, but realised that they are all going to be held during the weekends. Can you open up the workshops on weekday mornings? Please? Hi, even though I’ve subscribed to your blog a number times I haven’t receive any reply from you. HI I have not seen any of your questions – I think it got delegated to the spam folder..